Classroom Space Archives - Page 5 of 5 - Teaching Rocks! As the title expresses, it is a combination of five different tasks throughout the two-hour literacy block. Each essential task is a foundational element in literacy for the K-5 grade levels. This program allows for a change to the atmosphere in the classroom and the role for us teachers. It is a change from trying to manage students, from rushing around the room, from putting out fires, to creating routines and procedures that creates independent literacy behaviours to the point of becoming habits. Read to Self is the best way to become a better reader by practicing every day. Children are allowed to choose books that interest them at their appropriate reading level. During the implementation and training stages, children are taught how to select books at their correct reading level. Read to Someone allows for more time to practice reading strategies. This essential task helps students work on fluency, expression, to check for understanding, to hear their own voice, and to share with their partner. Work on Writing works the same way as reading, the only way students can be better writers is to write each day. Listen to Reading is a task that allows students to listen to examples of good literature and fluent reading. This task allows students to expand their vocabulary and become better readers. The last of the essential tasks is Spelling Word Work.This task allows for consistent practice in spelling which aids in fluent writing and the ability to quickly write thoughts down on paper. These tasks are to be done daily and students are given a half-hour within each task. They rotate between the tasks, but what the most important factor of this system is the choice that students have. Eventually, when all is implemented, students will have the ability to select which task they wish to start with and which one he/she goes to next (as long as all five tasks are done within the day). In order for this system to work smoothly there are six core foundations to make it successful. Trusting students is the first. This is not a blind trust but a method to build behaviors gradually through lessons and guided practice. Providing choice is the second core foundation. Choice is extremely motivating and allows the student to be in charge of his or her own learning. Third is a nurturing community. This foundation will create a sense of community thus providing members (the students) with ownership to hold others accountable for behaviors of effort, learning order and kindness. Next is the core foundation of creating a sense of urgency. This foundation will empower kids by allowing them the opportunity to understand why we teach a certain idea or concept. A purpose along with a choice will give the student the motivation to keep persevering and keep on task. The next very important core foundation is the building of stamina. This correlates to the constructivist theory. For the program to be successful, children must commence slowly, a minute at a time thus providing them with a teacher who will lay the foundation for success, support them, cheer them on, and help them succeed. Should this not be done, students will become frustrated and failure is imminent. Last but not least is that the teacher must stay out of the way. This is extremely important because the teacher must display trust and must allow students the opportunity to make their own decisions and monitor him or herself. I feel that the concept of the Daily 5 is greatly beneficial as students are really capable and if we work with them, we can truly empower them to be active participants in their learning process. The task is a great one, and there is a lot of preparatory work. 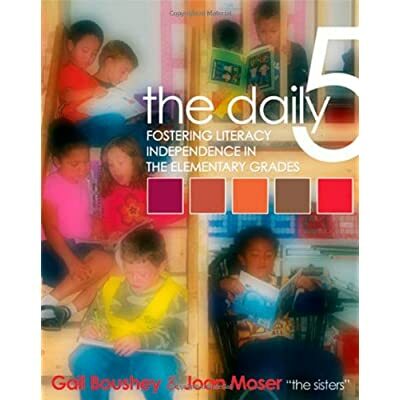 The Daily 5 does allow for more control overall, and it does dissuade behavioural issues within a classroom. The program fosters a comfortable environment where desks are the furthest requirements. A couch and lounge chairs are more appropriate. This is a complete detachment from the current state of classrooms. It is a fresh approach which requires a 2 hour block of literacy. The five essential tasks are an excellent foundation to literacy. I must stress that this is a complete change in mindset but a successful one. Some school boards have begun to adopt the Daily 5, providing teachers the support and the resources to implement the program. Should you choose to take on this system there are many websites that support your implementation. I hope you find the Daily 5 useful and the following websites to help you start. Disclosure: This post contains an affiliate link. All views expressed are the author’s own. Thanks for supporting our website! The Ontario Language Arts curriculum document is divided into four strands—Oral Communication, Reading, Writing, and Media Literacy. In both the Oral Communication and Reading strands, expectation 1.6 requires students to “extend understanding of texts by connecting, comparing, and contrasting the ideas in them to their own knowledge, experience, and insights, to other familiar texts, and to the world around them.” Being able to make a meaningful connection to the text is essential for reading comprehension and strategic reading; however, some students may have trouble actually getting their words down on paper. In order to help my students produce a well-developed written response (one paragraph or multi-paragraph), I tried to find some strategy that they could use to help sort out their ideas and give them a framework to follow. I first found the PEEL strategy on www.tes.co.uk and it appears that this writing framework is very popular in the U.K. After a small adjustment, I decided to try it out with my class and have achieved tremendous success with it. Point: provide the opening statement for your argument…what point are you trying to prove? When actually using PEEL with my students, the “L” became make a link by connecting to a personal experience, another text, or the world around you. This worked really well with my students and helped them not only make deeper and more meaningful connections, but they were able to easily extend their written responses without much struggle! Also, some of my students preferred to flip around the middle section and make it Point-Explanation-Evidence-Link because they wanted to first explain their argument and then provide evidence to back up their claims. After reading both sets of responses, I tend to agree with them and like having the explanation first and then the evidence as proof. I’m providing two worksheets to cover both formats (evidence-explanation and explanation-evidence). Also some classroom posters! Have fun! Debbie Diller’s 33 years in education spent as a preK – gr 10 classroom teacher, reading specialist, literacy coach, workshop leader, classroom makeover specialist, consultant, and author of books and DVDs provides her with both theoretical and practical knowledge of effective classroom design and organization. Although other resources provide information on classroom organization and design, Diller’s book actually has before and after pictures taken from classrooms she has made over, along with analysis as to why it did not work before and why it now does. The layout of the book is visually appealing, as Diller uses point form notation, colours, graphic organizers, large colour photographs, “post-it” notes with key points, and captions to make the pages clear and readable. Since Diller is a literacy specialist, the book has a clear focus to make the classroom conducive to literacy; however, she also addresses specific issues like ESL/ELL learners, preK, special needs, open classes, and technology. · A cluttered classroom is detrimental to learning and creates a negative atmosphere that may lead to discipline problems. · Backwards design principle: think about instructional goals, then design your classroom to achieve those goals. · The components of a well-organized classroom (e.g. large-, small- and independent-work areas, word wall, library, writing and math centres) support instruction, provide opportunities for student independence, reduce discipline problems, and engage students in their learning. · Teachers should not decorate their classrooms with store bought bulletin board sets; instead, they should plan their instruction and leave space for displaying student work! 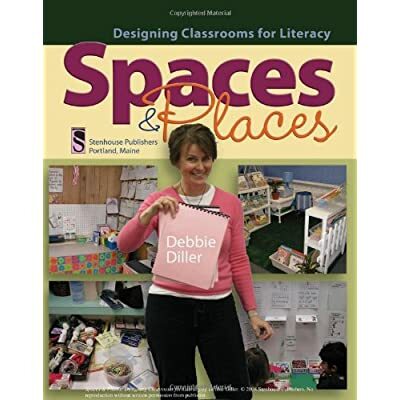 Spaces & Places is an awesome organizational resource, as Diller provides guidance for every area of your classroom…she even has suggestions about where to keep your office supplies so that you never lose your stapler! What I love best about this resource is that I can see myself succeeding! The suggestions are realistic, the before and after pictures are inspiring, and the suggestions are broken down into easy to follow guidelines. I love the simplicity and practicality! I loved this book so much that I lost focus many times, as I kept formulating plans to reorganize my class! I’m so excited to use the realistic and easy to follow plans (and the helpful worksheets at the back of the book!) to reorganize my classroom to make it more conducive to teaching and learning.